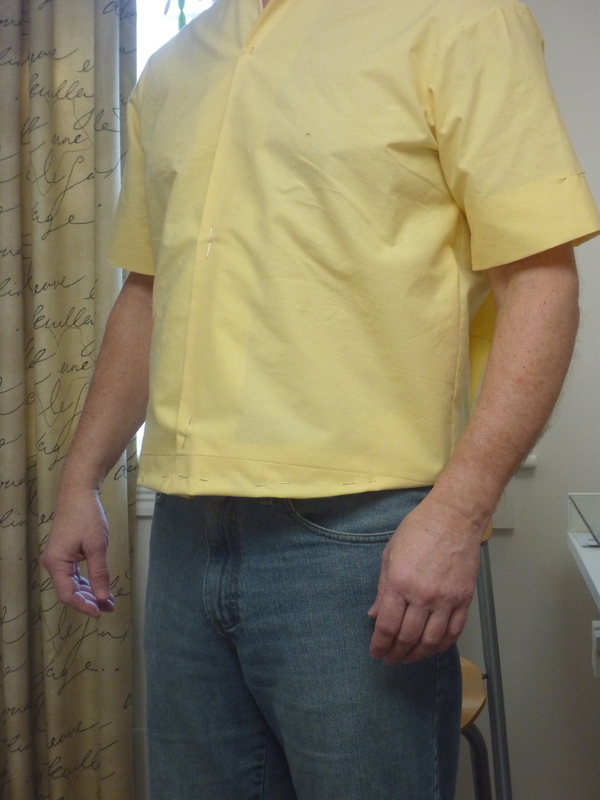 Readers, I'm postponing the photo shoot for Victorian shirt #2 until next week. I desperately need a haircut which can't happen until the 27th. I know the post is really about the shirt, but looking the way I do, I'll want to crop my head out of every shot. Please bear with me. In the meantime, there's another shirt to make! 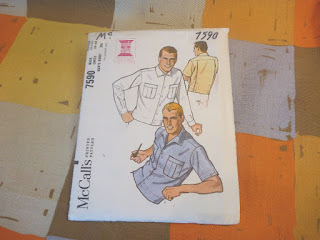 McCalls 7590 from 1964. I'm affectionately calling this the Cocoa Beach shirt. There's so much to love about this pattern. The back pleats extend all the way to the hem where they're buttoned in place. 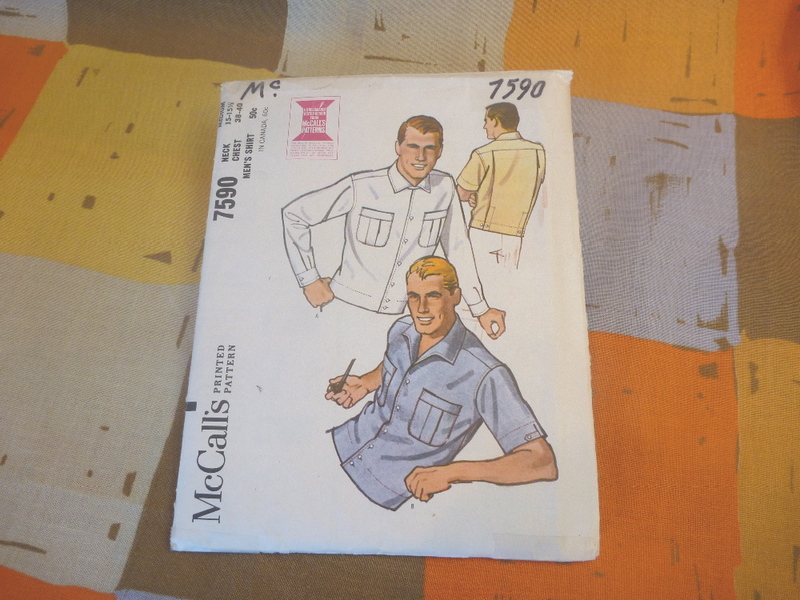 There are also button tabs on the sleeves. I'm intrigued by it's short boxy shape. I've never worn anything like this. Oh, and I'm always a sucker for a pattern with a pipe in the illustration. I'll be making the short sleeved version out of this block print cotton voile. I love the colors. There may even be a block of Tangerine Tango in there! I regretted not starting with a sloped shoulder adjustment on the Victorian shirt. It just prolonged the fitting of the muslin. This time I'm just jumping in. Let's face it, my shoulders aren't miraculously going to square up! This is my pattern from Peter's MPB shirt sew-along laid on top of the Cocoa Beach pattern. I'm just going to make this adjustment and hope for the best. I think this is called "winging it". So here we go. Muslin #1. On the positive side, the sloped shoulder adjustment worked perfectly. Yay! On the down side, the shirt is too short at the center front. Clearly my body isn't exactly like the tapered mannequin that this pattern was designed around. 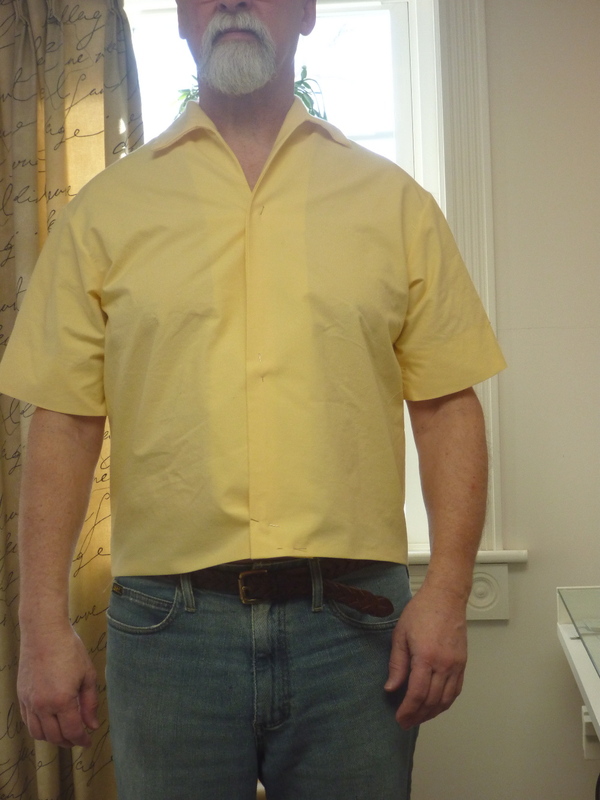 My, ah-hem, "protuberance" is causing the shirt to ride up in the front. This side view shows the problem more clearly. 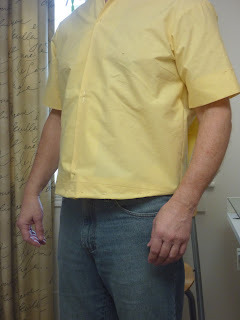 The shirt should appear straight across the bottom edge all the way around. 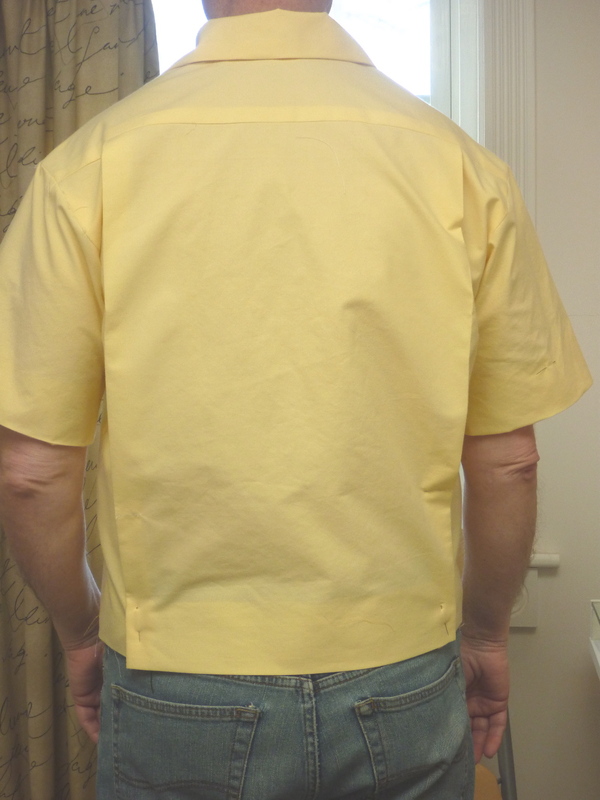 The back, on the other hand, is looking good and boxy, which I feel is important to the design. My fabric will only reinforce the angularity of the style. So here is adjusted muslin #2. I dropped the center front down 1.5". 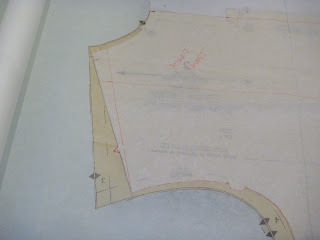 Then I drew a curve from the center front up to the side seam. The shirt now appears to be horizontal at the bottom edge, although it really isn't. I'll have to watch the horizontal lines of my fabric while I'm cutting to keep the curve as disguised as possible. I'm satisfied with the fit at this point and I'm anxious to get it cut out. I think this is going to look so cool in your fashion fabric. I'm very excited to see this pattern taking shape! Looking good so far. This is going to look sharp! wow, thanks for the invitation. I'll be sure to post something! Did you know the nice lady at Wesewretro put up a link to your blog, and boy, I 'm glad she did. The work you have done on the coats is formidable, they look fantastic you must be very happy with them. When I see just how much construction skill goes in to a coat like that I think of the armies of seamstresses and tailors who worked without electricity to kit out the armies of Europe in the 18th and 19th centurie. I 'm sure they were all blind by age 35. Anyway .... I am very envious of your cocoa shirt. 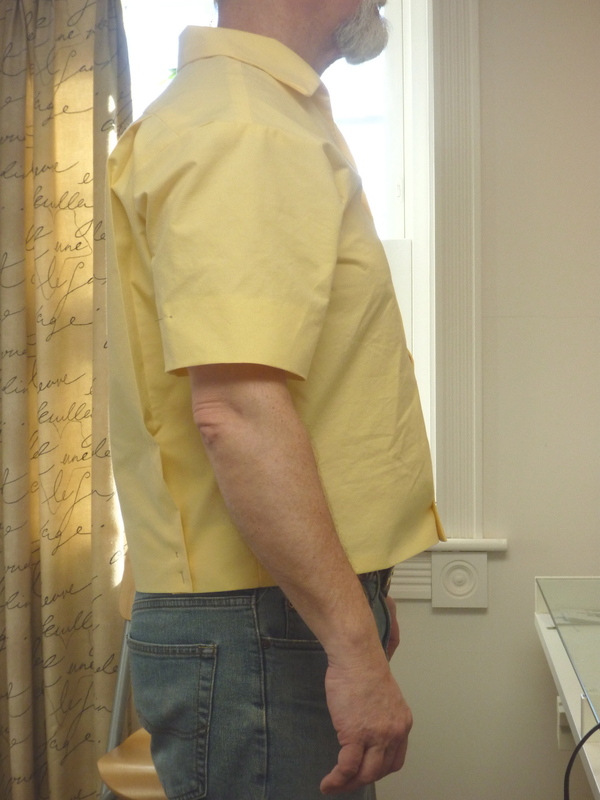 My husband is, ahem, short in the body and has to get his shirts altered. However he won't let me do it and uses an altering service. He has set up a retro gentleman's clothing company (of course I would not be so vulgar as to send you an unsolicited link in a blog comment) and put a lot of work in to getting the right kind of French cuffs and dips on the yokes. I also envy all your coats, I live in Western Australia and haven't worn a proper coat since I left England many years ago. Right, enough about me, your work is wonderful.